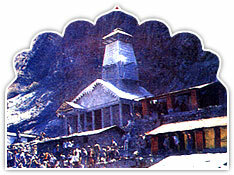 The revered shrine of Yamunotri, source of the shadow of the 6,315 mts. high Bandarpunchh mountain. It constitutes one of the four most important pilgrimages, collectively called 'Char Dham' of the Garhwal Himalayas. Legend has it that a sage, Asit Muni, used to reside at this secluded spot in ancient times. The chief attraction at Yamunotri is the temple devoted to goddess Yamuna and the holy thermal springs at Jankichatti (7 km. Away). The source of the Yamuna lies a further km. Ahead at an altitude of approximately 4421 mts. Since the approach is extremely difficult, pilgrims usually offer obeisance at the temple itself. For reaching Yamunotri, one has to undertake a 220 km journey from Rishikesh to Hanumanchatti, where the motorable road ends. The remaining 13 km journey has to be covered on foot or on ponies. The temple remains closed during the winter months of Nov. to April.